There are a few key elements of a website. But what about the most important element of all? Often, domain names are a foregone conclusion when we start to talk about the value of a particular website and how to make it work for us. But, in truth, if you don’t have a strong domain name, you don’t have much of a website. But there’s even better news. If you have a great domain name, you don’t have to have a great website. In fact, you may not need a website at all. Domain flipping is the art of buying great domain names and then selling them to those who really want them and who plan to build a company website. Buy low, sell him. Simple. Of course, if it was truly that simple, everyone would already be making money in the $600 million aftermarket for domain names. There is a skill and certainly an art to finding the domain names that will be profitable. There is also a serious element of patience in domain flipping – these are not going to be bought and sold again in the space of an hour. Many domain names are an investment. So how do you develop the skills to find, hold and sell the right domain names to make you a profit? 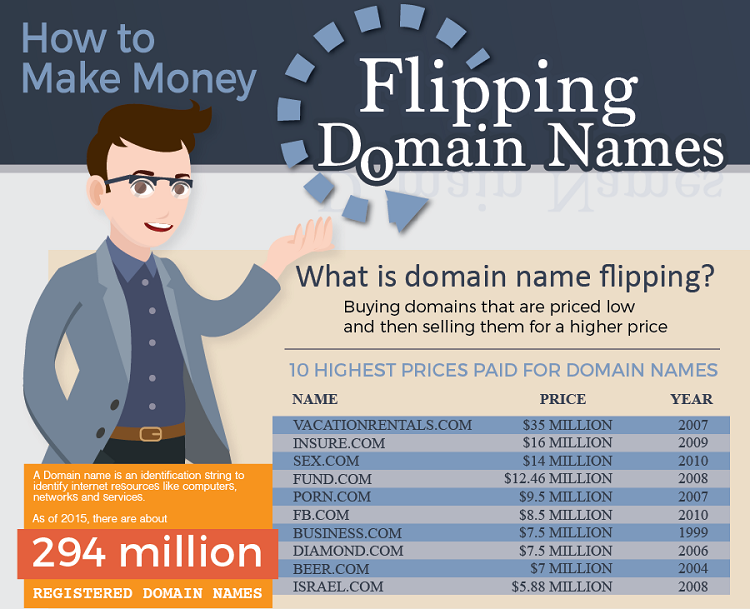 The infographic below will give you your first big lesson in domain flipping. Now that you have seen the basics of domain flipping, the process should be simple, right? Well, that depends on how well you know the markets, the online climate as well as your knowledge of how to go about buying and selling domains. Fortunately you don’t have to invest much to give domain flipping a try – you can buy domains for just a few dollars. But before you start researching and snatching up domain names, do some more thinking and planning. Check out emerging markets. Investigate popular niches. See what’s up and coming in your area. Work in areas where you have the most knowledge – your own niche, your market segment or perhaps your neighborhood. By starting with what you know, you’ll be in a great place to put your existing knowledge to work on a new skill set. But over time, as you see just how profitable domain flipping can be, it will be easy to start researching new markets, looking into what is coming next and perhaps even capitalize on future popularity. After all, nobody can create a killer website for that new company without a killer domain. Wouldn’t you like to be the one selling it to them? What a wonderful post and informative infograph. At my starting point of blogging, i did flip domain and i must say that there is a good money in that line of online business. Your Infographic has demonstrated to us how it should be and how to carry it out swiftly. Yeah, Domain Flipping can be a serious business. Flipping domains and tweaking it a bit to get more value out of it can be a good source of money. One of my friends had bought a particular domain name with no intention of flipping it, but someone contacted him and offered to buy it from him for $1,000. He was concerned in case it was some kind of scam, but the $1,000 was duly deposited in his bank and the transaction went through fine – so there can even be money in domain flipping accidentally! Yeah, when I used to flip domains I got some offers like that myself. Most of the time such transactions goes smoothly but yes, using a service like Escrow makes the process easy. Paypal with buyer protection works too, but then domains can be digital goods and how paypal will treat it in times of dispute isn’t easy to predict. Its really wonderful infographics with informative stuff. I guess domain flipping is really great business. I’ve seen lot of people making hundreds of dollars through it. I love the focus on patience. Being patient and present allows domains to age, and like a fine wine, many of these suckers yield max value after a period of time. Like anything in life. Some items have a short shelf-life – meats, dairy, etc – but most items appreciate in value over time. If you patiently wait, a domain can yield a fortune for you. Breathe. Wait. Prosper. Yeah, it is so true – even for websites of micro niches, I like to age them and grow them slowly overtime. These are our digital assets – domains, sites etc. and needs to be aged and taken well care of. Superb inforgraphics click for all the visitors for understanding the basic concept of making money from choosing top domain name. yes i am 100% agree with you that choosing a right domain name is a special art. If you can understand this art then you can become the master of online business legends. Do get a Gravatar and let us know your name so that we can attribute you. Surely, the right domain name makes a big difference to any business, which is the reason why people like to acquire the domains that best describe their business. Now Imagine if that domain is owned by you – how much money you can make by flipping it? but i want to know how much earn in one month from flipping domain? Good to know that you liked the article – as for how much you can earn, depends totally on the domains that you buy and their value. It is almost impossible to predict how much you can earn but there is a lot of potential in this business and it is worth trying out. I really didn’t knew that domain flipping has such potential. I guess I will need to start learning about this stuff. Yeah, domain flipping is an excellent business opportunity. Always good to add multiple revenue streams, so give it a try and let us know your feedback. Hi Oleg, thanks so much for your great article. I’ve known about domain flipping for a while and have read about a lot of people doing it. I tried for a while but just didn’t seem to have the foresight to choose anything that was profitable. I’ve learned much since then. Maybe I will try again. Thank you. Domain Flipping does requires a bit of effort and skill, especially when it comes to picking up good domains. Now that you have learnt plenty from your overall blogging experience, you can give it a try and see how it works. I was not knowing the importance of domain flipping. Thanks for addressing that it has such a potential. I guess I will need to start learning about this stuff. Great post and amazing information. I liked the way you presented the idea in the infographic. Domain flipping is an awesome way to make handsome money on the internet. As a purchaser of a domain name ! its your responsibility to make it sure that the domain you purchase perfectly represent your business in an organized fashion. Well, thank you so much for sharing with us an astounding information about domain flipping. As we all know that lots of people are making handsome amount of money simply by using this lucrative technique. I really appreciate your effort and the infographic is amazing. This is why I am so glad you wrote this article. Once someone learns how to do it as you well noted above, it can be a nice way to make some money. Yeah, flipping is fun too – just like a game. Good way to add an additional stream of earning and diversify our online portfolios. Domain Flipping is good business in Internet Marketing. But choosing a right and perfect domain; it’s very difficult and choose it. You added the perfect infographic about Domain flipping. Thank you for adding detailed information. Domain buying and selling is a great way to make millions but it takes time to understand the industry. I noticed you pointed out to buy a website/domain with pagerank, but i guess pagerank is dead for now. No update are coming on that one. Although, your infographic is good in content. Thanks for pointing out good points. Yeah, PR is dead, but there are other ranking factors that can be used, DA for example is a good way to judge a domain’s strength. For getting the domain indexed, build some links to it and it should get indexed. Great post ! Very insightful and informative post. Domain flipping can be profitable if you do the proper research. I have flipped a couple of domains and made some “change on the side” Thanks for sharing this value-packed post and have a prosperous day. What a Amazing post and informative. Yeah, Domain flipping can be a good source of income to supplement other income streams of Internet Marketing. Great stuff. I haven’t done any domain flipping in the past but this post is so useful and insight which compelled me to start one. Read something fresh after long time. Really I appreciate your work.Thanks a lot for this awesome article. thanks oleg i am selling websites but after read this i plan to move on domains also thanks for the great speech. where I can sale website?